There’s growing concern among Central New York dairy farmers that Canada is considering changing trade rules that could restrict its import of U.S. milk products. Milk silos at Cayuga Milk Ingredients' processing plant outside of Auburn. Senator Chuck Schumer stopped by Cayuga Milk Ingredients in Auburn today, a conglomerate of 25 dairy farms doing $25 million in yearly sales to Canada alone. Schumer says the proposal would be harmful. "If our producers who sell their milk products through this successful conglomerate are no longer able to tap those international customers that we've come to rely on, our upstate dairy industry could be in peril. In addition, the price of milk is lower than it's been in a while, so that puts another strain on our dairy farmers." Schumer says the proposed trade barriers would limit Canada’s import of foreign dairy products such as the ultra-filtered milk solids produced at Cayuga. CEO Kevin Ellis fears his company and farmers would lose market access. 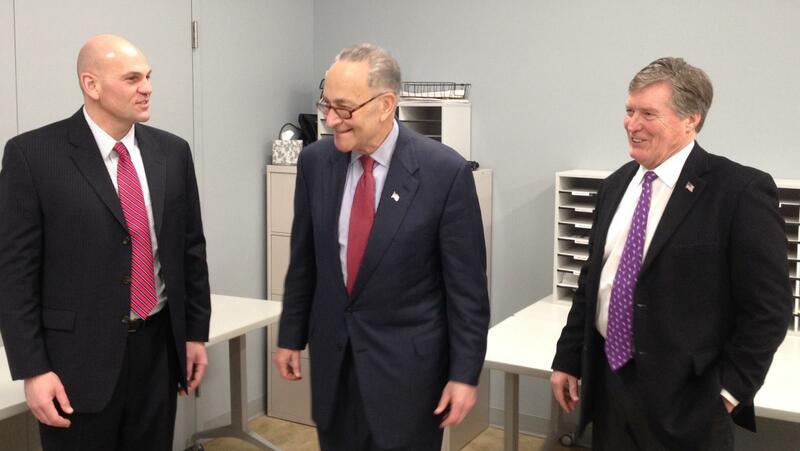 From left, CEO of Cayuga Milk Ingredients Kevin Ellis, Sen. Chuck Schumer, and Cayuga County Legislator Tim Lattimore. "Our jobs here depend on these export markets, and it's very personal to me. We've painstakingly hired some wonderful people at this company, and I never want to lay off a soul. I only want to grow this business. My farmers feel the same way." Sixty-eight people work at the processing plant. Ellis says and Canada has always needed a large quantity of ultra-filtered milk for their cheese industry. He says losing that business wouldn’t be a death blow for the new $100 million facility, but would undermine their plans to grow. "There's no question we'd still continue operations, but at a much lower profitability level. That is not our desired out come. 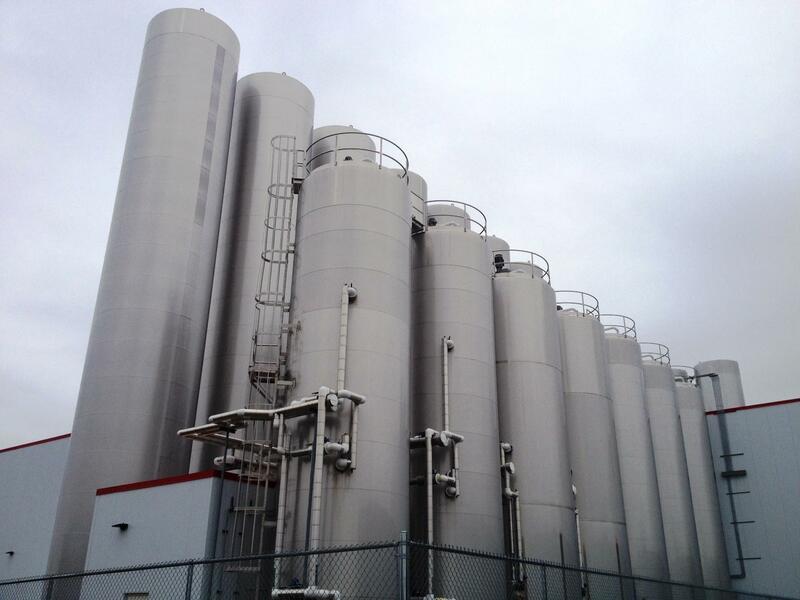 Our desired outcome, the reason we built this highly sophisticated milk plant, was to get value added. Without some of these markets, we lose that ability, and we lose the profitability that goes with that." Ellis says nearly 70% of their milk solids are being sold off shore. Schumer is pushing the USDA to ensure Canada complies with NAFTA and keeps trade open and accessible to dairy producers. 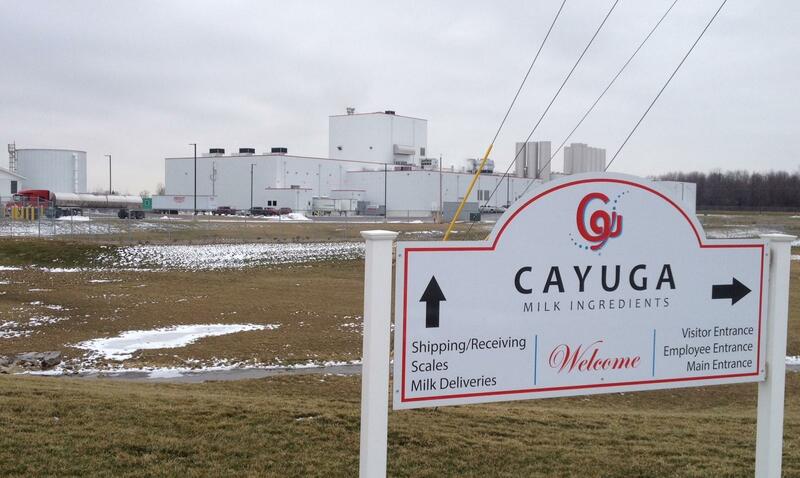 The entrance to Cayuga Milk Ingredients processing plant.